A beautiful yet original game is hard to come by these days, but Jellyflop is just one of those gems which I found to be both intriguing and creative. Packed with 100 fun and exciting levels, your protagonist, the jellyfish, will bound to give you loads of fun twiddling with your Android phone while whittling time away. Jellyflop starts off with Jelly, a jelly fish who wishes to fly after seeing seagulls soar through the sky. Jelly hatches a plan: collect enough feathers so that he would be able to fly. It is your job to aid him with his quest to collect all the feathers. 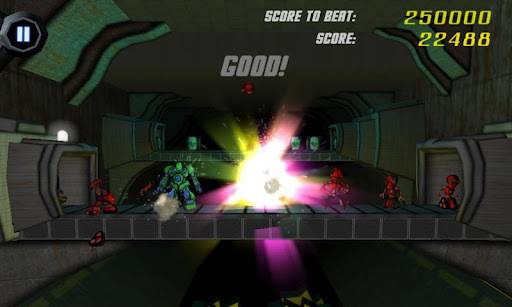 To help Jelly in his quest, you will assume the role of controlling him and his surroundings for every level. Your job will be drawing thick lines of pink to guide him to the feathers in each level. 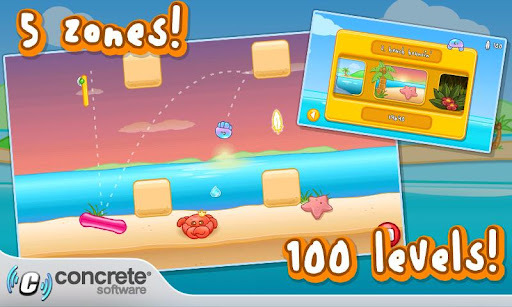 The first levels are for you to familiarize yourself with the game, ala a tutorial level of some sorts. 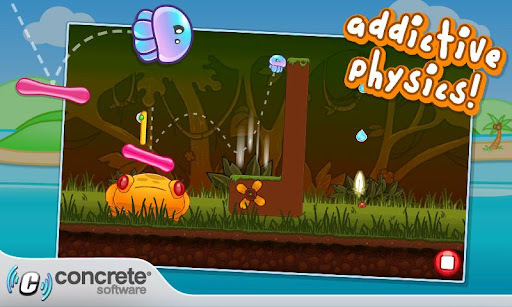 However, the game is very easy if you are accustomed to physics and creative thinking; this game needs loads of them both. Physics in the game is very accurate too, when you do everything to perfection, it is very satisfying to complete the level. 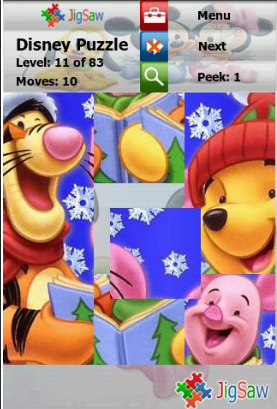 The pink lines are limited by a bar on the bottom left of the screen. However, some might feel that the difficulty level from the first zone to the second may be too steep, turning off some people. 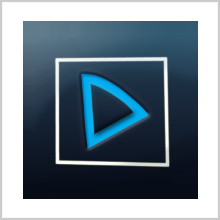 Unlike most other games with dull background, Jellyflop’s background is beautiful and vivid. Amphibious animals swim the waters below each level and beautiful clouds fill the back of the game screen. 5 zones are available for you to traverse, from the beautiful blue seas to the tropical green jungles. Backgrounds and new objects are introduced in every zone too. Each level is unique as well. Some of the levels contain newer mechanics which will make your game more fun, like the teleporting portals which transport Jelly from 1 side of the field to the other. 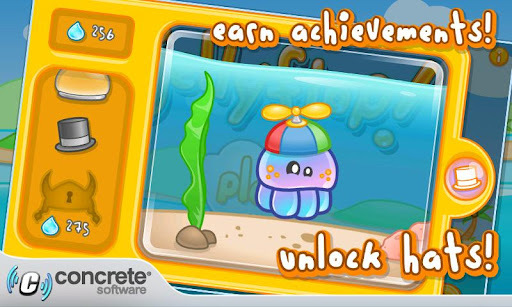 Another unique thing about Jellyflop is that you are able to play dress up with Jelly. Water droplets that spread themselves across the level are the game’s currency. Many items are buyable inside of the game’s store, with a top hat and monocle being the first thing that is available with minimal droplets of water. As you collect more, you can unlock more costumes, adding another element of fun to the game. While it is no point arguing that this game is somewhat like other popular games like Angry Birds, you should not stop there too. 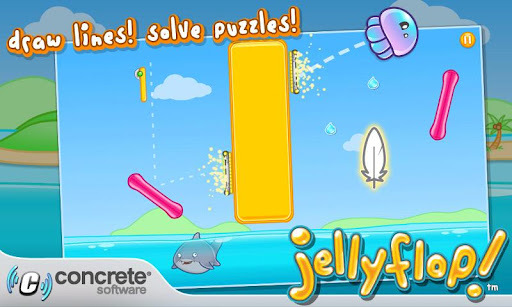 After you complete about 5-10 levels, you will understand that Jellyflop is in fact, very original and refreshing which is why a 9.5/10 rating is more than deserving of such a potentially record smashing game like Jellyflop.